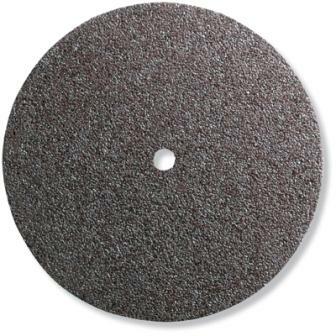 Dremel 540 Cut off wheels five pack 1 1/4"
New Dremel #545 Diamond Wheel A wheel completely coated with fine diamond particles for working with hard materials. Designed to last and not lose its shape or break, it provides smooth, fine cuts. Ideal for cutting, sawing, carving, sharpening and filing hard materialsincluding marble concrete, brick, porcelain, ceramics, epoxy and hard woods Do not run in excess of 20,000 rpm. 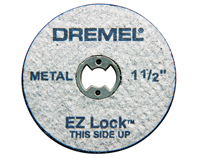 New Dremel #546 Rip/Crosscut blade is a long-lasting, mini circular blade that cuts both with and across the grain on wood and wood-like materials. The steel blade is 1 1/4" diameter and is designed to be used only in conjunction with the 670 Mini Saw Attachment. The blade mounts directly to the attachment so no mandrel is needed. The 546 blade has 48 cutting teeth. Kerf = .025" (.6mm) you do need the special #670 mini saw attachment which is NOT included. New genuine Dremel #561 Multipurpose Cutting Bit A high-speed cutter with a 1/8 steel shank. Ideal for cutting wood, plastic, fiberglass, drywall, laminate, aluminum and vinyl siding in a variety of applications such as preparing an area for light fixtures or making cutouts in cabinets and paneling.